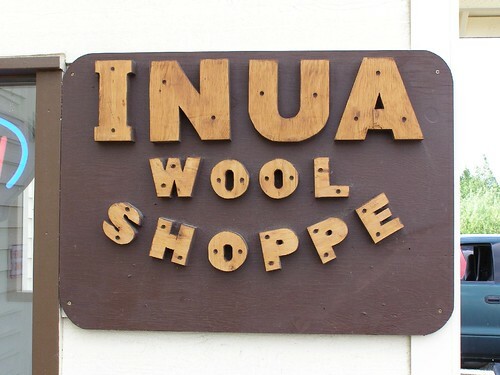 this is one of the signs (here’s the other) of the best yarn shop in fairbanks. one of the things i love about alaska is that people just up and put business in their homes, and zoning says it’s okay. this particular yarn shop was back in the woods in the owners beautiful log cabin home… but alas, it was small and cramped and you couldn’t fit more than a couple people browsing in at a time. so it moved, which I (of course) have mixed feelings about. what makes it so great? it has everything. shetland wool – you can find it here. possum, over there. cascade 220 and lamb’s pride – yup. five ply canadian wool as well as briggs and little – there. philosopher’s wool, quiviut, buffalo, cherry tree hill and the list goes on and on. it has traditional yarns, luxury yarns, sock yarns, basic wools – everything. she even had some spunky eclectic and cherry tree hill roving! i could live there. there’s also a sweet greyhound and her book selection is outstanding. my kind of wool shop. where has it moved to? an industrial looking building of course. another alaskaism… not much space for rent anywhere, all of it spread out with trees in between. very practical buildings. most of the best shops are in strip malls and every time we pass a new one, i have to look and see what’s there. in very short other news, i’m going to email in the rest of the book right now. if any shop in alaska carries my book, i hope it’s inua. i’d be honored. This entry was posted in community, knitting by cosymakes. Bookmark the permalink. sounds like a wonderful “Alaska Moment” there!